The move had been anticipated years, with speculation increasing in recent weeks as news emerged that Emirates, the largest customer by far for the airliner, couldn’t reach agreements with the engine makers on improvements; Qantas Airways canceled an order for eight in a long expected move; and Qatar Airways said it will start retiring its A380s at age 10. Speculation also arose that Tom Enders, who retires as CEO in April, would kill the program to clear the decks for his successor, Guillaume Faury. “The consequences of this decision are largely embedded in our 2018 full year results,” Enders said in a press release. The earnings will be released in a few hours. With a production rate of 6/yr, the A380 is at best about break-even. When Airbus launched the A380 in 2000, the market was very different. The Boeing 777-300/ER was launched the same year, but the plethora of twin-engine, twin-aisle, long range airplanes had yet to come. The Boeing 787 was first, in December 2003. It was followed in succession by the A350, A330neo, increased range of the A330ceo, the 737 MAX and the A321neo/LR. Each airplane further fragmented markets that otherwise would go through hubs to fill the A380. Airbus based the business case in part on analysis that passenger traffic doubles every 15 years and airport congestion would require the A380. It’s a story that’s been peddled since 2000, right through yesterday. Simon Pickup, a middle manager who presents every year at the Pacific Northwest Aerospace Alliance annual meeting in Lynnwood (WA), acknowledged an announcement was expected Feb. 14 (Toulouse time, 9pm Wednesday Seattle time). He carried the long-standing Airbus message about the traffic and the need for Very Large Aircraft (now called Xtra Large in the Global Market Forecast). But he didn’t have advance information about the announcement. Airbus still forecasts a 20-year demand for more than 1,500 “XL” aircraft (400 or more seats). This is filled by any aircraft, including the A330-300/900 and Boeing 777-300ER, configured with more than 400 passengers. Cebu Airlines at one point configured the A330-300 with more than 400 passengers. Air Canada configured the 777-300ER with 458. The 777-9 nominally carries 425 in standard three-class, international configuration. The A350-1000, nominally seating 365, could be configured with more than 400. Boeing had been reducing the VLA category forecast for years, to a few hundred, before doing away with it entirely a year ago. Boeing’s forecast now goes to 300 seats, with 777s, A350s and A330-900s falling within this sector. I see this as a win/win for Airbus: transferring orders from a doomed project to healthy programs. It does seem that way, as Emirates wanted a ‘six hour plane’, and 40 A330neos does that. Its not a win at all. Yes,the A330NEO gets sales (once again, the A338NEO is spurned) however the A350 was doing fine without Emirates. Lets not forget it costs money to shut down an active line-especially one like the A380 which has a large vendor/supplier/logistics/etc. base Then there is the situation regarding RLA. Also now basically the only “VLA” will be the B77X (though the A350-1000) will cover that segment as well. A win win, are you kidding…the biggest flop in commercial aviation history is axed, and your saying win win..
Not convinced smaller ab order is etched in stone either. Judging by the way EK places orders recently, who knows..
330 neo, really!! !..so much for all the praise about the 787-10… being the best 8hr.plane out there.. So far, no news on that order!! The best 8hr plane is the one in your fleet! There will be no news about EK’s 787-10 order because there was no order. The MOU will just quietly lapse. No fuss, no fanfare. As for the Emirates 787-10 MOU; it was never a firm order. Also, the A330-900 appears to be a better regional aircraft for Emirates. It looks like Boeing’s mission to put the A330 out of business has failed, however. Yes the A330 seems very hard to kill for Boeing. First attempt the 787-8, next -9 then-10 and finally 797-6/-7. We will see how the “cat with the mask” can evolve further, I would assume it will be the trail horse for Airbus 3D print, more carbon structures and massive weight reductions in several steps. RR has some work to do as well making the T7000 suitable for 2-6hrs shuttle services in mainly India, China and the US then do a cross Atlantic flight over night or a Trans Himalaya flight to the EU and back. The 777-300ER does it for Emirates and Tim Clark assumes the A330neo can do all EK India and Pakistan flying cheaper than their present 777 workhorses. It all depends on RR delivering Life on wing for the T7000’s . RR need AB to launch their next generation engines. If the T-7000 gives trouble geting AB or BA on board for another RR program will be difficult. Suspect RR’s survival might hang on the 7000 and the XWB running perfectly. Check my math: does this imply that the 747-8 will have outlived the A380? With the freighter market still ticking along it seems yes indeed the 747 will outlast the 380 in production and models flying. Even the passenger version seems to have a shot at outlasting it. So much for the plane of the future. The B748i pax version is out of production already. There are just -f on the list. “Triumph Group makes fuselage panels and sections, lower rudder sections and the empennage of the 747 under a contract with Boeing that expires in mid-2019. ” Flightglobal. My guess is that if Triumph/Vought want any more business with Boeing at all, they will gladly extend that contract from mid 2019. What’s your take on Emirates and the 787-10? Will they be less likely to firm up the order? I see them canceling this order however taking up more B77X frames-which IMHO will be fine for Boeing as the B787 line is doing just fine. There is no firm order for the 787-10, only a MOU. They don’t need to cancel it. Emirates walking away from the 777x would surely put a very large and expensive dent in that programme, wouldn’t it? All that work, and not much to show for it. I think it would be pretty bad news for GE; so far as I can tell the only other airframe they’re really selling engines on to is some of the 787s. They’re not on any of the current crop of Airbuses. Plus it’s not very clear if they’ve got anything substantial in the wings like RR and P&W do. Perhaps GE’s future depends on NMA being successful? Airbus can take some small comfort in that some of the tech they’ve got on A350 and A330neo came out of the A380 programme. I don’t know if Boeing have done some new stuff for 777x, but if so perhaps they could pivot that into NMA? Sad to see the demise of the A380. I’ve flown on it, very good it was too. Presumably if the market conditions did pick up Airbus could fairly easily stand up a refreshed design rather than starting from scratch, and would save a lot of certification costs. A 277 ton €25 billion, ego driven white elephant. It’s amazing all the blood, sweat and tears some posters here have put in to denying the obvious. I doubt we will hear a mea culpa. This is actually a great day for Airbus with all the talent and resources this frees up. It will be interesting to see where they go after all their legal troubles are through. It’s about time for a new clean sheet design. Of course it was ego driven. But it was also a viability test for Airbus to work as an integrated company. If you see how smooth the development and EIS of the A350XWB was you understand the value of the learning out of the A380 program. Team organization, integrated planning software, cross-site logistics, tool and process harmonization. And probably a shift in corporate culture to tackle technical debt early because it is so hard to fix it once the product is out in the market (wing & door issues). Thanks Scott, any idea which of the 330NEO and A350 models are involved? A question in peoples minds must be if EK will cancel these, only time will tell? Wonder if Airbus will use this time to review the A380 from nose to tail to have something in the drawer when demand for such an aircraft arises, and it will most likely do, its a matter of time. Each is the -900 model. What a great way to end a program! While ending production of an aircraft that was never profitable anyway, Airbus scored major orders in the hot twin engine widebody segment where it was trailing Boeing, solidifying the future of the A330-NEO, adding to the backlog of the A350, and substantially eating into Boeing’s market share in Emirates’ twin engine widebody line-up. It’s a major blow to Boeing, supplanting expected orders for 40 of the largest 787 model, and providing the likelihood of many more Emirates orders for these two models in the future. If cancellation of the A380 is a loss, it’s the kind of loss any manufacturer would love to have. “It’s a major blow to Boeing”..LOL! The B787 line will do just fine w/out the EK order. It’s a double blow to Boeing – aside from the loss of significant revenue that 40 787-10 would have brought in, Boeing had been working very hard to stop the A330neo in its tracks. We don’t know all of the details EK has with Boeing -just like the Airbus order,maybe EK will order more Boeing B77X as rumored. Well, each A330neo sold is one 787 not sold, isn’t it? Possibly, however as I mentioned above, there might be a “quid pro quo” between EK and Boeing. Also, Airbus/Rolls lost a good-sized A380 order as well. The “quid pro quo” thing; is that “insider knowledge” from that old Fleetbuzz bloke, Saj A.? Airbus swaps loss-making A380 orders for profitable A330neo and A350 orders. Rolls loses 156 Trent 900 orders, but gains 140 orders for Trent XWBs and 7000s (not counting spares). I suspect they’re OK with that. I’m afraid that five years after EIS of the 777-9, the B777X line will start to grind to a halt. And what is this comment based on? The 777X does have a similar or worse sales ptofile as the A380. On that basis OV-099 is justified. Qantas and ANZ will buy wide bodies this year. The 777X needs at least one of them. Equally, British Airways and Lufthansa will buy wide bodies this year or at the latest early next year. The 777X needs at least one of them. And so on… there are a lot of campaigns over the next few years because 777 classics and A330 classics are beginning to age. Based on the high likelihood of Airbus launching an UltraFan powered A350neo program in the near term (i.e. EIS around 2025). The A350-1000neo stretch would take out the 777-9 — with the former having slightly higher capacity and 5+ percent lower TSFC etc. In fact, I’d expect Emirates to cancel about half of those 150 777X aircraft on order and replace them with A350-1000neos and stretched A350-1000neos. Sour grapes and wishful thinking. 2025 is not going to happen. And do you bet your future on RR with all its issues? There are no issues with the Trent XWB engine. The problem for the 777X is that once the A350neo is launched, it will be even more difficult for Boeing to garner new 777X customers. It will also be harder to keep the ones they’ve already got. In fact, I would be surprised if 777X deliveries would ever exceed 200. When the sales are there to prove your statements with regard to the 777X then I and others will believe you. As the article makes clear, with regard to the A380, the dynamics changed with the 787, A350, A330neo and, yes, the 777X. But those words apply to Boeing products as well, not just Airbus products. The 319 tonne A350-1000 will do 8700nm. So why buy a 777-8 at 352 tonnes. But then why buy a 777-9. It doesn’t match the A350-1000. Etihad appears to have cancelled 19 out of 25 777X. They are still looking at their 787 order. But as Scott said they don’t want their 787-10s. Qatar haven’t specified an engine for their 787-9. Perhaps they now know the wing isn’t big enough for 254 tonnes in a hot climate. Will they cancel and buy A330neos? Emirates in the end could not ignore the dynamics. Having said that, they did take the view that they could force Airbus to NEO the A380, just for them. So they are having a strop. In the end they will have to buy the A350-1000 if they want to be competitive. Jacobin777…Airbus pride , nothing more, you’ll quickly find any Boeing fan, is in the minority on this site!! It’s quite intriguing to see some fanboys dream on without seeing reality. Net widebody orders last year score was 218 to 71. That’s almost triple! This closing down of a great engineering marble and yes, financial and market reading failure its big. Yet you see fanboys reacting as if is a win win. Even if the 70 frames Emirates had to take are solid. Airbus is not just canceling their 39 units. They are cancelling the whole programme and its other remaining orders. Any common sense unbiased aviation enthusiast would be sad the A380 is ending and would also bet Boeing will again kick Airbuses behind all over the widebody production and orders chess board this year. @Philip-the sales for the B77X are there. EY are potentially canceling some B77X orders. A The 319 tonne A350-1000 will not do 8700nm at full payload. Those are niche routes anyway. I expect the B779-9 to improve as time goes by not to mention IMHO it is “the biggest VLA in town” as there is no way the A350-1000 will have a configuration > than that of a B779 in most customers setup. 10-across helps the B779. Only a tiny fraction of A350 customers will have 10-across in economy-and those seats will be around 16.0-17.0′ (as A359 customer French Bee has in their economy section). Assuming these orders go ahead I won’t be surprized if the 350-1000 comes into play at some stage, especially if the rumored 350NEO version (2025?) becomes an reality. Its sector and seat mile costs should be better than that of the 778 and could be a good replacement aircraft for 77W’s on many sectors where the 779 is to big and the 778 to heavy, etc. The B778 is a niche aircraft and the oft-rumored A350NEO still wouldn’t be able to out-fly the B778 with a full payload. Not to mention, the B77X will be having continuous improvements as well. Keep whistling past the graveyard! I must admit that the situation is improving for the A330neo. Hi Fly are going to buy 10, MAS are likely to place an order having let the 787 go. Other sales are likely. The 330-200 one of my favorites, I am keen on the 330-800. But with AB now in a “mood” to take hard decisions will they review the 338’s future? If they don’t get significant orders in the near future could they “mothball” it? Kuwait has 8 on order, they could be possibly convinced to take 339’s at the price of the 338? The 338 has competition form the788 and 789 and potentially and NMA, time to review? So AB could focus on the 339, streamline the 330N production line and offer the 339 at very competitive prices. Very different situation with the A330-800/900. Specifically, it not just about selling the A330neo it is also about forcing Boeing to reduce the price of the 787. My own view is that Boeing have at best made precious little out of recent sales of the 787 and may have made a loss in their failed attempt to kill off the A330neo. Airbus will also make money out of the A330neo to the point that it will be a moderate cash cow. Just a mean idea (with regards to all Brexiteers): than Airbus has PLENTY of space to transfer wing manufacturing to Hamburg (close to outfitting in Bremen) and Toulouse…. An even meaner idea: UK withdraws from NATO; new, direct pact with US/five eyes group. Bye, bye Germany and France. that would be even dumber than brexit. but then, never underestimate the stupidity of large numbers of people. That is just insane. The only way that happens is Vladimir gets to be UK PM. But getting back on topic. I do agree, this is another opportunity for the E.U. to punish UK for Brexit. And that’s not a good thing for anyone. Airbus works with manufacturers outside of EU now , US , Korea, it has a FAL in China. Why should a Brexit make any difference to structures or engines made in UK. Just as Italy’s( inside EU) Alenia works with Boeing (outside EU) on the 787. Fair enough. But other countries offer more (cheap labour (compared to Europe) or market entrance (China and the USA). I can deal in US Dollars (the same cash I get for my planes). The manufacturing sites in Broughton for the A320 are 30+ years old and limited revamped, hence outdated. Ergo, when I do the planning for a new wing (XLR, A320NEO+, NSR, A30X or whatever) with 80(?) shipsets per month, I need free space AND can save on the logistics….?!? Good point of basically “free” space becoming available. AB could use it for building whatever they see best. 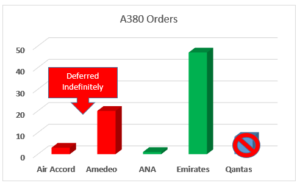 Is the A380 order book closed or will it still accept orders if it fits in with the ramping/winding down production schedule? It’s effectively closed. EK couldn’t find anyone willing to supply them engines for their last order, I doubt any other airline will change this. Came across this article where Etihad indicates its plans with Airbus and Boeing orders. 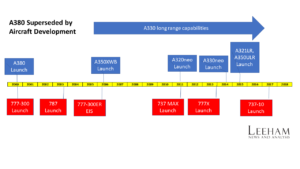 If correct this a serious blow for the A350, maybe that is A359 slots EK is picking up? The report does make clear that it’s not just the A350 order that has been restructured, the 777X and 787 orders have also been restructured. It’s not surprising. Etihad is no longer a clone of Qatar Airlines/Emirates Airlines. Instead it just flies to and from Abu Dhabi. It happens. I don’t think the Qatar/Emirates business model will last much longer, anyway. Point to point will mean that the Middle East will no longer be a gateway to the east and a gateway to the west. point to point is great, but the cost advantage of hub and spoke remains. people who factor cost into their travel (i.e. 90+% of travelers) will, more often than not, trade hours for $$, so the geographic advantage isn’t going anywhere. Why do you assume point to point will be more expensive? AirCanada is planning to fly A220 Vancouver to Halifax. I bet this will be same cost or less than routing through Toronto. Plus will save cost of a mean in TO. If you have to leave passengers behind to fly point to point, then you are in a botique model. SA is doing that with SA to NY. All of 170 some pax. Only on a luxury route will that work. it can be complex, but learning it is recommended. the basic premise of the ME3 (or Iceland Air for that matter at a smaller scale) is that by bundling everyone in city A who wants to go to anywhere in Asia on to a hub about half way there, where they meet 1 of 40 outbound planes going various destinations. all of those planes just came in loaded to the gills with everybody from their source city that wants to go anywhere in Europe. that way they have 90+% load factors on every plane they fly, all the planes are very fuel efficient, and every plane is carrying a lot less fuel weight than they would if they were flying point to point Europe to Asia. net net is less total fuel burn, better load factors, more network flexibility. unfortunately for them, each of the ME3 airlines/host nations made some really stupid financial decisions/unfortunate political moves that are now crushing their finances making them have to scale back their expansion plans. Passenger numbers growth at hubs is still higher than for point-to-point. Scott,do you see a link between one Emirate cancelling 40 A359’s ( although not ‘official’) and another ordering 30 A359’s at effectively the same time? Or simply a coincidence of timing. Just 5 x A350-1000’s doesn’t make sense in a “large” fleet, could possibly increase to X in future? The 778’s will most likely also be cancelled and “replaced” by 35K’s. Can see Etihad’s wide body fleet of the future consisting of 787-9 & (10’s), 350-1000’s and 779’s? Got a feeling something is bubbling in the background between EK and Etihad and so will be their fleet decisions. Per Airbus’s presser, Etihad will take 20 A350-1000s and have dropped the -900s. Yep, Airbus 2018 results press release say’s 20 A350 (-1000), the rest cancelled (42 A350S). Bloomberg say only six 777X (-9) down from 25, the rest cancelled (19 777X) and restructuring of the 787 order will come later. @Phil, I think it is a happy coincidence, for it opened timely slots for EK. I’m not sure when EY were supposed to get their A350 deliveries, but today’s press release says that EK will be getting their A350s from 2024 onwards. Would slot availability be important here? To see this announcement at the same time as an article by Dan Catchpole on airline industry congestion is quite galling. It is almost as though airlines need to be saved from themselves. Congestion will only get worse and one obvious solution was to package long haul core routes into big double deckers such as the A380. Perhaps govts and airports could have nudged the A380 to success by taxing/charging more on a per flight basis to make the economics of the bigger but more efficient people carriers more compelling. In ten years the A380’s loss will be lamented by many. Put world airlines blindness on account of their “capitalistic egocentrism” meaning that airline decision-makers consider their industry or community roles to be limited strictly to selecting, introducing and operating aeroplanes, leaving (with zero empathy) up to other industries/communities to crack the other nuts = airport/airspace management/financial puzzles. There is an obvious lack of holistic mentality : will we ever enjoy a “three musqueteers” conundrum where airlines/airports/OEM/ATC/regulators will work all-for-one + one-for-all? Reformulated, cornering the business is what Airbus would need to lobby for to revitalise an A380-900 Neo, let’s call it by its name ? Anti-trust regulators want to separate horizontally aggregated business conglomerates, but when straight-forward WELLM analysis (cf IIASA, Laxenburg, Austria) puts a stopper to further airport expansion plans, then certain before questionable BCG strategies retrieve status as commendable !? Interesting developments indeed and I think Airbus will come ahead in the future. The lesson learned here is that you do not design and manufacture planes just for few middle east players. Chances are the 777x will be too big and heavy outside the Middle East and even for Etihad or Qatar. Emirates cancelled the A350 because Airbus changed the specs without prior consultation. Here we are are again. As for Etihad, I suspect they will cancel the 777x, the A350-900 since they already have 787 and the A350-1000 will be a better replacement for its 777-300ER. With the A350-1000 ultimately going to 319t with a range of near 8700nm, the 777-8 won’t be needed and I suspect Qatar willl cancel it as well. I suspect a Now that the A380 is cancelled, enhanced NMA killler and stretched A350 will surface. You make a major mistake with co-flatting where the A380 wound up vs the ego project idea it would sell all over. It did not sell all over and it never sold in the F versions they touted. The whole model/concept was rotten as the data was biased to drive a goal. 747 concept was long gone but they refused to believe that. Aluminum loosing against Carbon plus the wrong wing. If you look at the timeline of the A380 two events are sticking out: The launches of the full carbon 787 and A350. And in my eyes it’s these planes that are killing the A380, not the 777. Because of their low weight and great aerodynamics they offer comparable range and efficiency as the twice-as-large A380 that is mostly “heavy” aluminum. If the A380 would be built like the A350 and feature the same engines, the whole game would look completely different. Still, it was not wise to make a wing so big and strong that it would also fit a larger -900. This cost the -800 several % in efficiency and is also more expensive. Does that mean that extra large planes have no future? Well, I don’t think so. You ignore the fact that filling a huge aircraft is very hard and they are not the least bit flexible in that you can’t put them on other routes. To deal with the growth in air travel this will become a hiatus and something big will be needed. The densification will only take airlines so far before the ATC/Hubs stop groaning at the seams and break. No, I don’t ignore that fact. But that would be much less of a problem if the A380 would be on the same level technology-wise as the 787 and the A350 and thus enjoy the efficiency advantage it should have due to its size. Gunfulf: My broth has a say, if ands and butts were candy and nuts we would all have a merry Xmas. What would an A380 cost to make now? And would someone sane put that kind of money into it? The 787 is what 10 years old now? You can’t just come out with a new bird every 10 years, they have to be build to last in a market that works. Its one of the wonders Airbus succeeded as a quasi government entity. That has validity, but it also misses a few key points. It has to be a lot more efficient than anything else because it needs to be full. So what you ar missing is, smaller wing, its still hard to fill it. Impossible on many routes. I think Emirate was running Dubai to Scotland. Small market, but they were talking routes that made not sense to fill an A380. The program was also sold on a stretch and freighter. It failed as an F as only a very few places could bulk it (FedEx, UPS) – cargo density would mean it was part full and still using a lot of fuel. Could the EK 339 order mean that AB doesn’t need to reduce A330 production rate?